Property 30: Superb 18th century farmhouse, in the heart of the vineyard. Cottage in the heart of the traditions of Alsace. 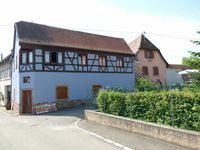 Property 42: Cottage in the heart of the traditions of Alsace. Property 47: New Kertzfeld cottage, luxury performance in Alsace countryside.